We are going to continue our article on finding the best perennials for your garden based on different growing conditions. If you missed our previous posting, see it here. If your garden has some shady spots there are many great, unique perennials that actually thrive in the shade. These perennials include beautiful flowers in a variety of colors, groundcovers with flowers, plants that have lavish foliage, and climbing vines. So if you have a shady spot, why not try one of our selections. 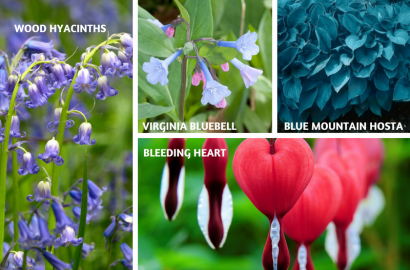 Virginia Bluebells - Virginia Bluebells are native to the United States and differ significantly from other varieties found in different places around the world as they have foliage in place almost all year round with the exception of summertime. They have beautiful blue, bell-shaped flowers that bloom in mid-spring. They grow best in part shade and moist soil. If you see this plant in its native habitat, don’t dig it up as it may be an endangered species. Hardiness zones 3 – 8. Wood Hyacinths – This flower is also known as Spanish Bluebells. Wood Hyacinths are less fragrant than other varieties of Hyacinth and the blooms hang off the stem in an arcing pattern. They are always blue or lavender and are hardy in garden zones 3 to 8. Wood Hyacinths are very versatile and can be used in rock gardens, flower beds, and borders as well as along walkways. The strap-like foliage will appear first and is plentiful and robust. The flowers emerge later in the spring and bloom for several weeks. They do well in both full sun and the dappled shade found in woodland landscapes. More details can be found in this article. Bleeding Heart - Bleeding Hearts are known for their unique heart-shaped flowers. While the flowers are typically red there are pink and white varieties as well. They are an excellent choice for moist areas on the edge of woodlands where they also find shady growing conditions. The plant grows 2 to 3 feet tall but after it blooms, usually in June, it will disappear until the following spring. It is usually a good idea to plant something in proximity to it that can fill that space for the rest of the season. Bleeding Heart is a perennial and hardy in garden zones 3 through 7. If it likes the spot it is planted in it will readily self-seed as well. Blue Mountain Hosta – This plant is one of the best blue hostas with its intense, attractive blue-gray puckered, heart-shaped leaves. The plant has large white flowers that bloom in the summer. In order, for this plant to turn blue it needs to be in full shade. Plant in well-drained soil. This plant can also be grown in a container. Hardiness zones 3 – 9. While other plants may suffer from fading blooms or scorched leaves in direct sunlight, these perennials will love every minute of these bright, unfiltered conditions! Be sure to provide a minimum of six hours of sun to see these flowers at their best, and know that the more sun you can give them, the bigger, healthier, and happier they will be. Karl Rosenfeld Peony – This beautiful Peony has bright red double flowers suspended above its glossy green foliage. Peonies are considered to be relatively pest free. Ants on peony buds are common and totally harmless. Once they're established, they're as hardy and dependable as oaks, creating a fantastic season of bloom in your yard year after year. They make a great early season rear of the border candidate and while the flowers do need staking their beauty makes that task worthwhile. Peonies are an old-fashioned favorite that never goes out of style! Hardiness zones 3 – 8. Read more about the Peony Plant in this article. 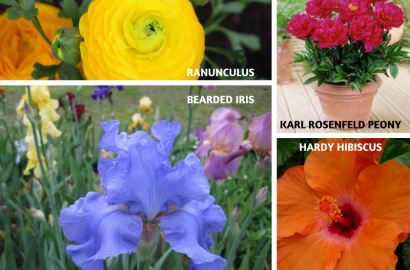 Bearded Iris – This flower is named after a Greek Goddess and comes in many colors. These flowers are easy to grow, hardy and some of them re-bloom in the same season. The large outer petals are called “Falls” and the inner petals are called “Standards”. The Falls are considered the beards. These flowers will bloom in early summer. They need at least a half-day of the sun in well-drained soil. If they don’t get enough sun, they will not bloom. 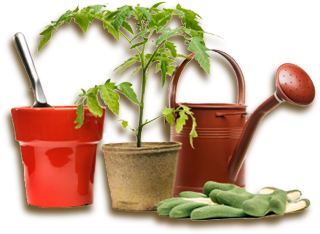 Hardiness Zones 3 – 10. See our article on this beautiful flower. Hardy Hibiscus - Hardy Hibiscus is also known as Rose Mallow. We love the large colorful blooms of this plant; a real show stopper! They come in white blooms and in shades of pink and red too. We enjoy the tropical feel they add to our garden and while they may look and sound exotic they are really easy to grow. Perennial Hibiscus is usually one of the last perennials to break dormancy in the spring so don’t be worried if you don’t see them right away. With proper care, these plants will produce beautiful blooms summer after summer. Hardiness zones 4 – 9. Want to know more about Hardy Hibiscus read our blog post. 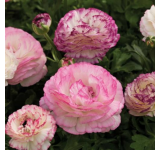 Ranunculus - Ranunculus have blooms that resemble a rose and are used frequently in floral arrangements and bouquets. The flowers can last for weeks and are particularly well suited for containers. In warmer garden zones they can be planted in the fall for blooms the following spring. In cooler zones, they are planted in the spring for blooms that arrive in time for the cooler temperatures of the fall. 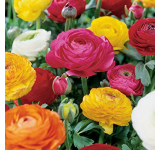 Ranunculus bulbs should be planted in soil that drains well as they will rot if they are left in standing water. They are treated as perennials in warmer gardens (Zones 8 – 10) but are best treated as annuals elsewhere. 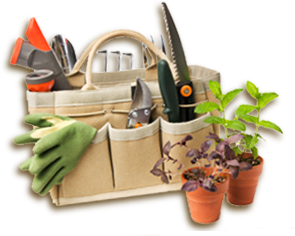 If you have any perennials that you think we should add to our lists, please let us know on our Facebook page.